If this were to happen for real—well, hope you have a fallout shelter nearby. The largest country in the world by area, Russia has plenty of room to hide things. Naturally, that includes nuclear missiles. 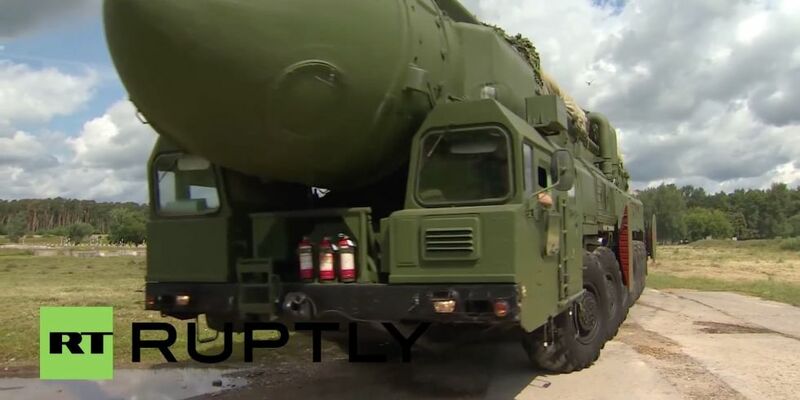 Unlike American missiles, which are stationed in concrete silos, Russian intercontinental ballistic missiles (ICBMs) are deployed on large truck-like vehicles designed to prowl the country's road networks before unleashing Armageddon. Russia Today has a story on a Russian strategic missile exercise that involves a massive convoy traveling from European-Russian border all the way to the Mongolian border. Russian mobile ICBMs have established, permanent bases but leave in groups on month-long patrols. This particular 400-vehicle convoy includes Topol, Topol-M, and Yars mobile missiles, as well as command and control, security, and logistics vehicles. Topol and Yars missiles are capable of delivering one to four nuclear warheads within roughly a thousand feet of their target, making them accurate enough to destroy American missiles in their silos. This makes them a formidable first-strike weapon capable of wiping out a significant part of the US nuclear arsenal, if the Russians were so inclined. The giant vehicles are TELs, or transporter-erector-launchers, specialized vehicles designed to give a heavy missile a smooth ride over rough roads. TELs not only store the missile but can launch it in the field. The launch tubes can be reloaded back at base (assuming, of course, there is a base to return to). The smaller vehicles are logistic, communications, and command and control vehicles. Mobile ICBMs are vulnerable to ground attack, particularly enemy special forces who may attempt to destroy the missiles before they are launched. The convoy relies upon a Taifun-M armored reconnaissance vehicle to detect ambushes on the ground. Taifun-M bristles with sensors, including forward-looking infra-red, radar, and traditional optics, and can allegedly detect enemy troops at 3 kilometers. Also part of the convoy is a tracked robotic vehicle equipped with a machine gun. The unmanned vehicle can move quickly close with an enemy threat and eliminate it before the enemy can shoot at the giant, highly flammable rockets with nuclear warheads strapped to them. We've said it before, and we'll say it again: these mobile ICBMs are terrifying.